The stereotype of beauty queens as Barbies with silicon breasts stuffed into swimsuits topped off with tiaras is starting to loosen its self-righteous grip in my mind. 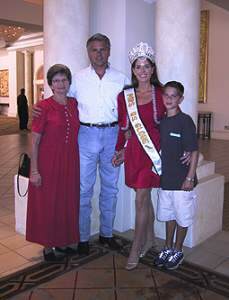 The pageant gals I spoke with: Mrs. United States 2001, Dana Opsincs; Mrs. Globe 2001, Stacey Cooper; and Mrs. 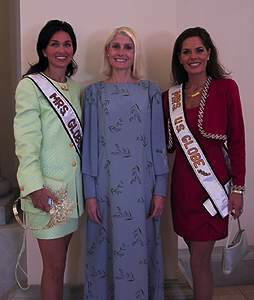 US Globe 2001, Becky Coomes are well-rounded women who are as different as well, Barbie, Skipper and Kelly! For example, Opsincs thrills to the roar of engines revving up for a death-defying chase around the NASCAR racetrack. Cooper loves chasing yellow tennis balls around the court in hopes of adding another golden trophy to her collection. Mississippi born and bred Becky Coomes delights in touring her state giving ‘I-think-I-can’ motivational speeches to school children. As Cooper munches her Boston lettuce, I ask about communicating differences in front of children. “You have to stand together on every issue with your children. You can argue points behind closed doors,” she says. Psychologist, Robert Jameson (who is married to the owner of a successful Santa Monica skin care salon) declares that, “the advantage of couples with common goals is like a corporation with a mission statement.” When conflict occurs, couples can steer their Love Boat back on course by remembering their mutual interests. Indeed, car racing is a fascination Opsincs and her husband, Bill have shared for 17 years. Mrs. United States 2001 and her beloved also revel in swooshing down snowy slopes together. “Bill and I love to ski. In fact, we’d love to move to Colorado,” she says. “So why are you still in Florida?” I ask. Certainly expending energy and effort to realize heart visions are nothing new for Opsincs, Coomes and Cooper. Strutting the catwalk with confidence in Atlantic City or anywhere else is precipitated by months – years of disciplined diets and exercise regimes.